On June 16 we had an unexpected visitor at the Grand Victorian. 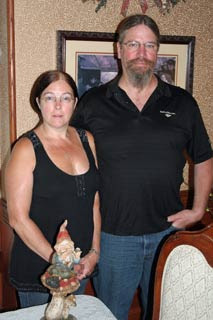 Turns out a traveling Gnome accompanied Bruce and Mary Nielsen for the night. The Gnome loves to travel and wants its picture taken along the way. As a result, he's been pictured at many fine restaurants, parks, riding motorcycles, driving exotic cars, ...and now, here at the Grand Victorian! In the above picture he is seen joining our guests for breakfast. You may notice he's a little groggy. Just the night prior he spent several hours entertaining on the bar at our local Short's microbrew pub. 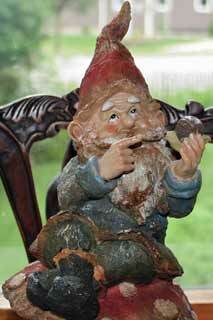 Anyway we thought it'd be fun to share a couple of pictures of the gnome and his traveling companions. Enjoy!